How much does a concrete slab cost for a shed, 12x12, 10x12, and more. On this page I'm going to share with you what it cost to install a concrete slab for a shed. I'll give you the basic costs for a 10x10, 10x12, 16x12, and 20x20. My name is Mike Day, I own this site and I also own Day's Concrete Floors, Inc. I've been installing concrete slabs since 1985. These shed slab prices will include the costs of labor and materials for installing the concrete slab only, not any sub-base work or gravel you may need to put the slab on. Please understand, I live and work in Maine. These prices are for what I charge and could vary significantly depending on where you live. The prices you see will be in U.S dollars. How thick does a shed slab need to be? On a good compacted gravel base, a 4 inch thick concrete slab will be all you need to build or set a pre-built shed on. Four inches of 3000 psi concrete is plenty strong enough to hold the weight of the shed and any contents you're going to put in there. How much does a 10' x 10' shed slab cost? The cost of a 10' x 10' x 4" thick concrete slab for a shed will cost approximately $1100.00 dollars. 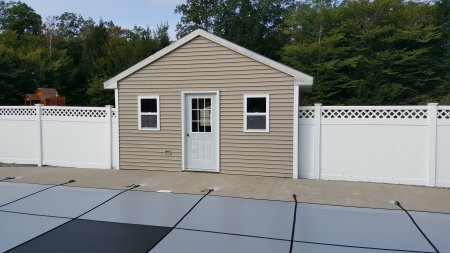 How much does a 10' x 12' shed slab cost? The cost to install a 10' x 12' x 4" thick concrete slab for a shed will cost approximately $1185.00 dollars. How much does a 16' x 12' shed slab cost? How much does a 20' x 20' shed slab cost? What is a small load charge for concrete? Most all Ready mix concrete suppliers will charge a fee if you order less than 5 yards of concrete. At least where I live it's 5, it could be more where you live. This small load charge fee is different for all suppliers. It could be more or it could be less. The $100.00 dollars you see in my prices reflect what I get charged in Maine. Why is my labor rate the same for all 4 sizes of shed slabs above? I have a minimum charge of $750.00 dollars for most small slabs 20' x 20' and under. This covers my time to meet the customer and talk about the project. My time to do the estimate and email it out. My time and my employees time to install the slab. And hopefully a little profit when I'm done. Whether the slab is 10' x 10' or 20' x 20' the time (labor) is pretty much the same. Everyone will price them a little different, this is what works for me and my company. Any slabs over 20' x 20' and my labor rate starts to go up. What if I don't have a good gravel base? Let me be clear, as a concrete contractor, I don't recommend pouring concrete right over clay or loom. It's better to remove 6" or 12" of it and fill the area with compacted gravel, sand, or stone. Loom and clay don't make a good sub-base for concrete slabs, they hold water like a sponge and get soft when it rains. This could cause the slab to settle or heave if you live in and area where the temps get below freezing. Should I install Styrofoam under my shed slab? First, let me explain what the Styrofoam does. 2" of Styrofoam under a concrete slab will help stop the sub-base from freezing under the slab in the winter. If the sub-base freezes and heaves, it could cause the concrete to crack and lift. If you have a good gravel base and no clay or loom under the slab, then you'll be fine without the Styrofoam. If you have clay in your soil or a lot of loom and just put down a little gravel over it, then having the 2" Styrofoam under the slab is going to help keep the concrete from heaving in the winter. 2" Styrofoam costs about 35 - 40 dollars for a 8' x 4' sheet (32 sq ft.) It's not cheap but does a good job of protecting the sub-base from freezing. Is this a DIY project? Can I install the concrete slab myself? How to Form and Pour a concrete slab just like the pro's do. I will teach you each and every step you need to do to correctly build the forms for the slab and then how to pour and smooth the concrete for the slab. 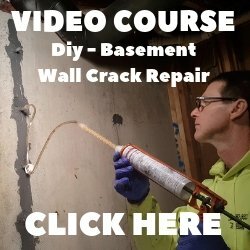 This course will save you hundred's of dollars VS hiring a concrete contractor. It's all in video format so it's very easy to follow along and learn the proper techniques as you go. 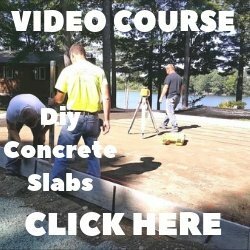 I highly recommend taking this course if you're thinking of installing your own concrete slab for a shed.